You can take a lot of artistic license with these crowd-pleasing twists. Use any puff pastry, whether store-bought or homemade. (If buying store-bought, we swear by Dufour, which is made with actual butter and not hydrogenated, chemical-tasting stuff.) Vary the spice and cheese according to your whim, whether chile powder or cayenne, Cheddar or Manchego. Play with the width if a skinny twist just doesn’t offer enough substance for you. Suit yourself. And let us know what you did. 1. Preheat the oven to 400°F (204°C). Line 2 baking sheets with parchment paper. 2. On a lightly floured surface, unfold the puff pastry. (Depending on the brand of puff pastry, you may have either 1 or 2 sheets.) Lightly sprinkle the pastry sheet(s) with flour. Grab a rolling pin and roll the pastry to between 1/8- and 1/4-inch thickness. (If using an 18 1/2-ounce sheet, this will measure about a 12-inch square.) Lightly brush the pastry with some of the egg mixture. 3. Sprinkle the Parmesan and paprika evenly over the pastry. Using your fingers, gently but firmly press the toppings into the pastry so they adhere. 4. Using a sharp knife or a pizza cutter, slice the puff into 24 strips, each about 1/2 inch wide. Divvy the strips between the baking sheets, seasoned side up. Working with 1 twist at a time, hold an end in each hand and twist the strips at least twice, twisting in opposite directions to create a long spiral. Place it back on the sheet and repeat. 5. Bake the twists until puffed and golden brown, 16 to 18 minutes. Let cool to room temperature before serving. Wow! Super easy and so versatile. I can’t wait to try this with a million other toppings! This is a great and easy recipe for some rather fanciful party fare. I made mine with some smoked paprika (pimenton) as opposed to sweet and was very pleased with the results. Infinitely adaptable, these can be dusted with all sorts of cheeses, spices, seeds, etc. They’re never more than a few minutes away as long as you keep some puff pastry in your freezer.I let my pastry thaw for about 30 minutes on the countertop while I prepped my baking sheets, grated the cheese, heated the oven, and whisked the egg. Seasoning and twisting the 24 pieces was accomplished in less than 10 minutes, and mine were cooked to a delicious golden brown in just over 16 minutes. New addictions rarely come easier than this. Super easy yet elegant hors d’oeuvre. The twists were very skinny—you may want to cut fewer (perhaps 18?) if you want them to be slightly thicker. You can also experiment with the kind of cheese—I think that perhaps adding a bit of Cheddar would be nice. Make at least a couple of batches; they go quickly! These were delicate and nicely browned with a great Parmesan taste. They make a tasty appetizer/snack and they’re fun to eat. Everyone loved them. I’d make these again. I rolled the dough into a 12-inch square and cut it into 1/2-inch strips, which made 24 twists. Next time I think I’ll add some fresh parsley and dried oregano. I highly recommend this recipe, and will be adding these to my holiday party this year. 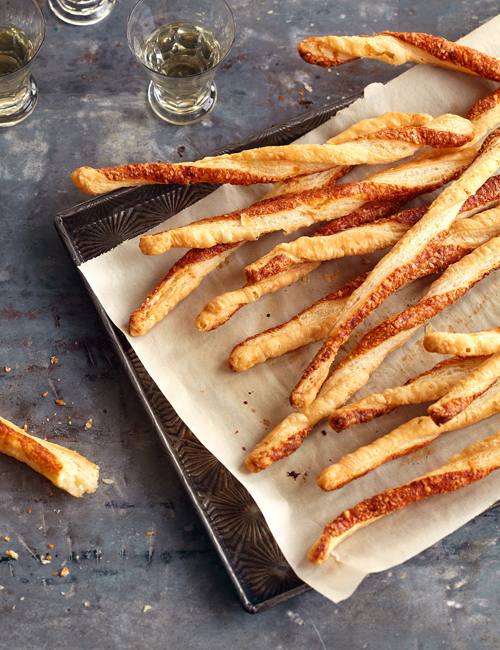 These Parmesan Twists are a great addition to a party or a dinner as an appetizer nibble. The color of the paprika adds a festive note, while the cheese gives a rich, slightly salty flavor. There’s not much to add to the recipe, except maybe a touch more Parmesan. If you’re lucky enough, you can buy the puff pastry sheet all ready to go in a 12-by-12-inch square. I had a bit of a problem finding an 18 1/2-ounce sheet of pastry, but a 1-pound package still worked quite well. 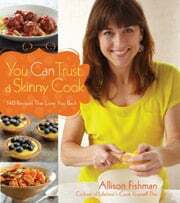 Parmesan Twists Recipe © 2011 Allison Fishman. Photo © 2011 Lucy Schaeffer. All rights reserved. All recipes and photos used with permission of the publisher.